The original game was made during a 3h minijam at the Berlin Indie Games Jam 2010, last August. The theme was “fish”. So, I made a simple fishing game. I was actually very happy with the result, and I have been working a bit on it during the last weeks. These days I am interested in “procedural generation”. 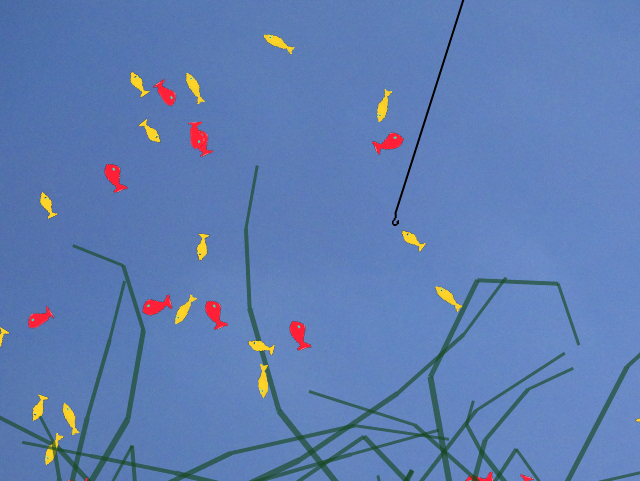 Therefore, the polishing of this game has been adding seaweeds (although they look a bit like green tentacles) and bubbles. I also changed the gameplay a bit. Now it is not a game at all, because there is no ending, you can go fishing forever. I would rather describe it as an interactive screensaver. You can sit down and relax and watch the fish swim around, and from time to time try to catch one. If they escape, just have patience. I tried to make the controls as simple as possible. This is a single button “game”. Any key (except m) or even the mouse button works. With that you can launch your rod and pull the fish that you catch. It might be hard at the beginning until you get the hang of it. If the music (just a contiuous loop of a few seconds) annoys you, press “m” to turn off the sound. New fish are generated as you catch them, the game ends only when the user gets tired of it and presses “ESC”. The biggest roadblock has been the music. Actually, that’s what I have been trying to do for the last two or three weeks, without much success. Finally, I’ve given up trying to make good music and I just threw in some repetitive loop. Sorry if it gets annoying. This entry was posted in Finished Games, JamGames, Löve2d, Other Jams. Bookmark the permalink.